This Combo Therapy Equipment is available in different sizes and appreciated by our clients. These are easily adjustable as per the requirements of the customers. These are known for their features like light weight, compact size, portable, long service life and durable. They are available at affordable prices. These equipments’ are easy to use and require less maintenance cost. We are the prominent manufacturers, exporters, and suppliers of Digi Combo 4 in 1 IFT MST TENS Russian Current to our esteemed clients. These are fabricated using the superior quality material. Clients can avail from us at the affordable price in the market. We offer these in various specifications and can be properly customized as per the specifications provided by the clients. Our products are tested on various parameters in the industry. We present an exclusive range of Combo MST TENS Dual Channel to our clients. 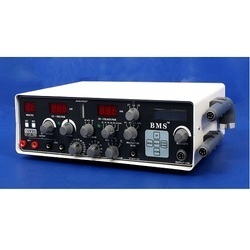 This combo -MST-Tens dual channel is manufactured using best grade raw materials and advanced technology. 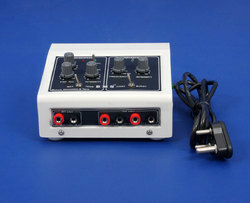 Clients can avail this combo -MST-TENS dual channel at a reasonable price in the market. This combo -MST-TENS dual channel is widely appreciated by our valuable clients for its high performance and superior quality. We have gained vast expertise in offering a better-quality range Combo IFT US TENS Russian Current. This combo - IFT-US-TENS- Russian current is manufactured using superior quality raw materials. 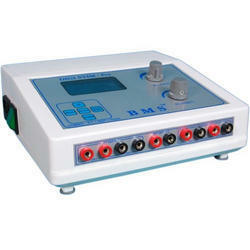 We are the leading manufacturers of Combo-US- MST-TENS Dual Unit. Faradic Frequency 50 Hz/ 0.7 m Sec. We are leading manufacturers of Combo US MST Tens. BMS having the combo of three modalities in one machine it is most useful for the home visit. 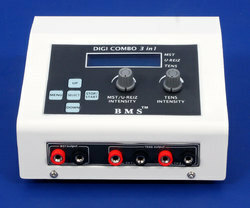 BMS combos are compact size, trouble free operation, light weight, and cost. No need of carrying multiple machines to house visit and one clinic to another. We are the leading manufacturers of Electrotherapy Ultrasound Equipment. Looking for Combo Therapy Equipment ?